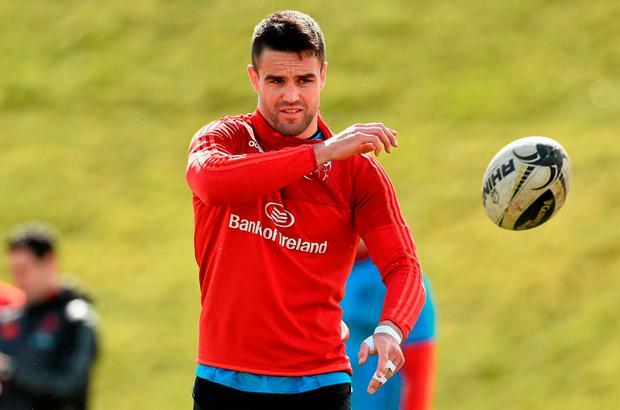 Conor Murray will be given 'every opportunity' by Munster to prove his fitness ahead of this Saturday's Champions Cup quarter-final against Toulouse at Thomond Park. The Ireland star hasn't played since leaving the field shortly after half time against Wales in the penultimate Six Nations fixture, with the province today announcing that they are continuing to monitor his shoulder injury ahead of this weekend's return of European knockout rugby to Limerick for the first time since 2014. In more positive news, Keith Earls has recovered from a shin injury to take part in full training while his international colleagues CJ Stander, Simon Zebo and Donnacha Ryan all took part in the squad session too. Munster will desperately want Murray to be fit for the visit of French giants Toulouse, with Rassie Erasmus' men currently favoured to repeat the quarter-final victory they achieved in 2014 when Guy Noves brought the four-time European Cup winners to Thomond Park.